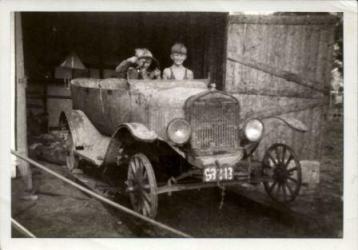 Below are stories of Model T Fords from visitors to Modeltcentral.com, written by them, in their own words. Their discovery, history, restoration and favorite touring country. We hope you enjoy reading them. My name is Geof Baulch and I live in country Victoria with my wife and two sons. My earliest memories of our T are when my Father spoke of it in 1966 when I was 7. I can remember when my Dad was given the car, he and one of his mates setting to work, removing the head amongst other things. I obviously had an interest at a young age as I thought I was being helpful pouring diesel on the bonnet hinges to keep them working. The T stayed on our family farm for many years and I remember the Chickens roosting in it and pumpkins being stored in it. The hood wasn't on it and all the cushions and igniton key were missing, but everything else was there. 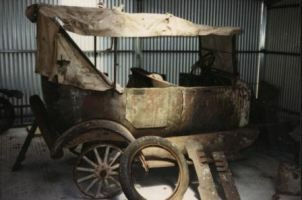 In the 25 years my Dad owned the car, he dismantled most of it ready for restoration, but due to lack of time and other commitments it remained that way. I received the car in 1992 as a trailer load of "junk", a giant jigsaw puzzle and I steadily worked over the next few months carefully piecing it back together. It proved essential as it helped me establish what was missing and what was worn and needed replacing. I then took it all apart again ready to start restoration, something that seemed daunting at the time. It took me about 10 months to realise that there really were only three main parts to the car, the chassis which I needed to get powder coated, the body that needed repairing and painting and the engine and electrics that I felt I could tackle myself. All the running gear, the diffs, springs and anything I decided would be black, went to be sand blasted and powder coated. The body went to a local sheet metal workshop to have the rust cut out and repaired ready for painting. Then the body went to the spray painters to be painted. This I decided should be two pack. We knew the original colour and pin striping of the car from some parts of the body that were constantly covered and so were not rusted or faded. Jackson's in Sydney were the suppliers of the new valance panels, as there was enough left of the originals to make a copy. The two front mudguards were irreparable and so new ones were purchased from East Coast in Sydney. 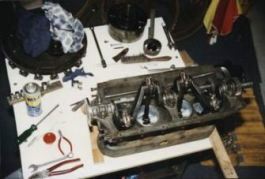 The engine was then my challenge whilst all of the above was being attended to by others. I realised that the motor hadn't done many miles at all due to the small amount of wear on the bores. I replaced the pistons with aluminium ones when I put the engine back together. I didn't have the main bearings rebabbitted at this stage as they appeared to be okay. ( 2000 kms later however they disintergrated and were replaced and rebored.) I had the cam shaft reground and checked the valves were replaced with new ones and adjustable lifters were also installed. The big end caps were drilled and chev dippers were installed to assist with lubrication. An outside oil line was also put in to help the somewhat inadequate oil feed system that is standard for 'T' Models. 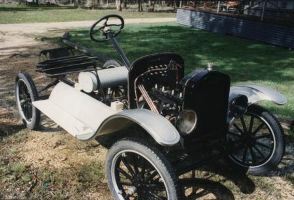 The transmission was balanced, rebushed and installed numerous times to get the air gaps on the magnets and pickup bobbins as close as possible, so that the motor , when finished , would run on it's original system. Once all the powder coated parts came home, they were reassembled to form a neat, well finished package. I was happy now as it really started to look like I had done something. The body came home next in its original state, nice and neat, so now I had to be extra careful with the spanners. The new guards and valances could now be fitted and everything lined up. Then to the painters for its makeover. Next were the wheels and tyres, I could use the original wheels but second hand felloes were purchased and plated. 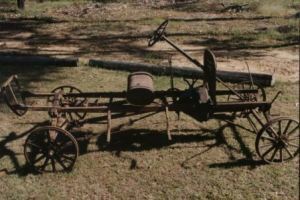 The tyres were purchased from Antique tyres in Melbourne. Now that it was all on wheels it was taken to a mates place that is an upholsterer. We then worked on it together . The hood we copied from what was left of the old one and I could still use the original bows. The windscreen was replaced with toughened glass to keep up to safety standards. The headlight reflectors were re silvered and the original glasses were reinstalled. All electrics on the car are 6 volts, as standard, and once started the magneto is used for the spark. Now that everything was finished and oil, water and petrol were installed in the correct places I set about starting it. Like all restorations that haven't been started for many years the first start usually takes some time, which results in a few blisters. But once started it can be tweeked and adjusted to run smoothly. A new ignition key was sourced and purchased from America. From the start it has taken 3 yrs of which about only 2 yrs was work and 12 months thinking about it. I have now clocked up close to 10,000 miles without any major mechanical problems. 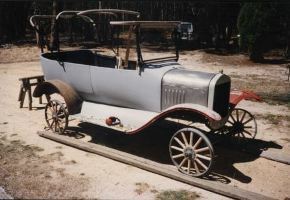 The car is a 1924 Model 'T' Ford Tourer and has only 3 doors( no drivers side door) which is original. It is khaki green with a white pinstripe all the way around the top of the body. The guards ,valance panels and running boards are black. The hood is cream coloured canvas. All colours are original as taken from the body and remaining hood remnants. 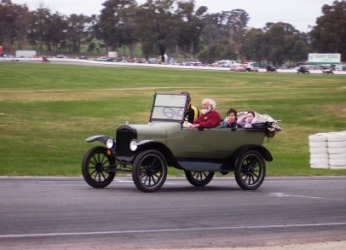 Have A Great Story About Model T's? 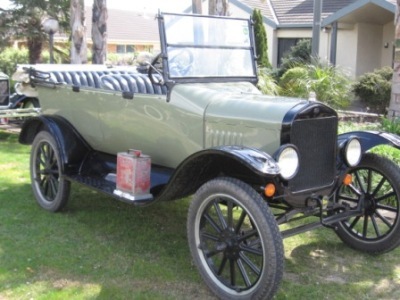 Do you have a great story about your Model T, like the one here from Geof? Share it with our readers! What was it like when you found it? Do you know its history? What challenged you the most when restoring it? Where do you take your T on trips? We'd love to see the "before" & "after" photo's of your T and even better, your T out on tour in your favorite touring country! Do you have more than one image to send? Complete this submission, then use the Contact Us button on the navbar on the left to advise what you would like to send and that it relates to this "My Story". To avoid us both getting SPAM, this process is necessary for a short time. You will receive an automated response with an email link to send extra photo's to. Or do you use picasa, my space or slide.com etc slide shows? Add the link to your slide show in the previous text box and I'll do the rest!